Jerry Schmidt, an avid shooter and hunter from Montana, has created a tool designed to help install single-dovetail or double-dovetail rings on hunting rifles. Jerry’s invention, the Scope-Tru Alignment Bar (patent pending), is unique. Unlike most other alignment systems, this is a single, long precision machined rod with a pointed forward end. You work on one ring at a time, first setting the front ring in the dovetail and then setting the rear ring. The process is shown by Jerry in the video below. CLICK HERE FOR PART II of Full VIDEO, showing final version of Scope Alignment Bar. CLICK HERE for a short VIDEO Showing the Final Version of the Scope Alignment Bar. The Scope-Tru Alignment Bar is CNC-machined from TGP bar stock, and will be offered in both 1 inch, and 30mm diameters. 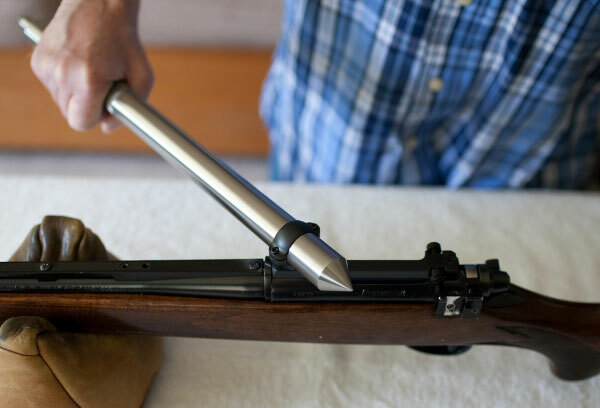 The durable bar is designed for regular, long-term use by the professional gunsmith, the home gunsmith or “gun crank”, and retail or wholesale sporting goods store staff. The 1″-diameter, all-steel Scope-Tru is can be purchased for $135.00 plus shipping and handling. The version for 30mm rings AND a new combo 1″/30mm Scope-Tru tool are both in final development, and could be available in the near future. To place an order for a 1″-diameter Scope-Tru, CLICK this LINK. For more info, visit Parabola-LLC.com, phone (406) 586-1687, or email info [at] parabola-llc.com. CLICK HERE for a shorter video that shows the entire mounting process in a compressed time format. Share the post "Scope-Ring Alignment Tool for Hunting Rifles"
Where do I get one of this scope-tru aligning bar? sometime about the middle of october 2011, my website should be up and running. or, you can phone me at the number listed above in the article. what’s the overall length of the bar? the overall length of the tool is 18 inches. the barrel length (the section where the rings are set) is 9 1/2 inches.